Today USA Basketball officially kicked off its campaign to reclaim the World Championship in Istanbul, Turkey with a decisive 106-78 win over Croatia in their first game of the FIBA prelims. I got a chance to talk with Mike Krzyzewski and Jim Boeheim last week. Both are so proud of the effort their young USA squad has put forth so far. But they know it’s an arduous road to the Finals (they must play five games in six days during the first week of competition), and they understand what a difficult task it will be to go the distance. As basketball has increasingly gained global popularity over the years, the level of talent has steadily increased among international clubs. So coaches and players alike know they have to respect every opponent. Team USA played solid ball in the exhibition games leading up to the first round, beating China, Lithuania and France fairly easily. However their friendly against the 2006 defending Champion Spain was anything but, and it wound up being an unbelievable game. The highly anticipated matchup was a huge event in Madrid and there were a number of luminaries in attendance including Pau Gasol and soccer super star Cristiano Ronaldo. Spain’s much more experienced, veteran team proved a tough test for the U.S. 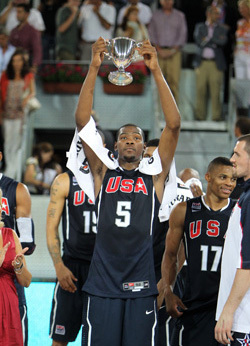 But Derrick Rose and Kevin Durant were sensational – Rose stepped up on offensive with a huge left-handed layup to put the USA ahead by one point at the end of the fourth, and Durant followed up on defense, blocking Spain’s would-be game winner as the clock wound down. Coach K also pulled a great tactical move by going to zone defense (Boeheim’s specialty) during Spain’s final possession, causing a little confusion on Spain’s part. For the USA to be able to hang on and come away with the 1-point win had to be a confidence booster for this young squad, as well as a warning to their opponents. 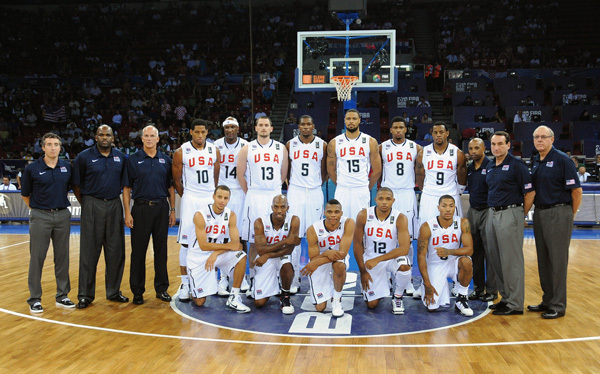 Greece is another very good, veteran team that managed to upset USA in the Semifinals four years ago. Though our roster was filled with stars, the Greek squad had the overwhelming advantage in terms of experience, having played together for three years. Our team’s lack of familiarity in regards to playing with one another wound up costing us a shot at the title. And lack of experience in terms of both playing together and competing at the international level is still a concern for the fresh new faces who comprise the majority of this year’s roster. 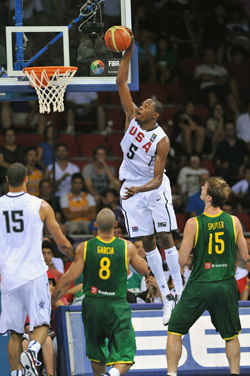 Though Wednesday’s 87-59 win over Greece was heartening, you can’t put too much stock in Team USA’s sweep of the friendlies. Greece was missing a few of their best players including center Ioannis Bourousis. And most teams won’t show all of their cards until the tournament gets underway. USA’s team chemistry has looked good from the start of training camp, but players still need to figure out their roles and how to play together. Practice time has been a scarce commodity. But the experience of playing a handful of international competitions heading into the tournament was invaluable. It will be interesting to watch these young players grow up and develop in the international arena. A number of them will be the nucleus that moves forward to the next Olympics. While we’d expect to see marquee guys like Kobe, LeBron, Wade, Howard and Melo return to Team USA, their participation is not certain. And if they do compete in the next Olympics, it will probably be their last. So we will see this nucleus that we’re cultivating step forward to replace a lot of these veterans when they retire from international competition. In addition to many formidable opponents, Team USA will also have to contend with the intensity of the impassioned crowd that will fill the Sinan Erdem Dome in Istanbul. It’s going to be a wild scene. I’ve been there, I know. The enthusiastic fans never stop with the cheering and chanting and singing – they carry on throughout the whole game. It’s a great basketball atmosphere. Team USA may not be the overwhelming favorites in the 2010 Championship Tournament, but with our extreme athleticism and unquestionable talent we certainly rank among those teams expected to seriously contend for the Naismith. The key will be to create cohesiveness in a short period of time and to continue to improve with every game. I’m excited for the next couple weeks of tournament play. I only wish that I could hear Marv call the games this weekend because he does such a great job with the pronunciation of the Croatian and Slovenian names. I’ve always admired him for that. 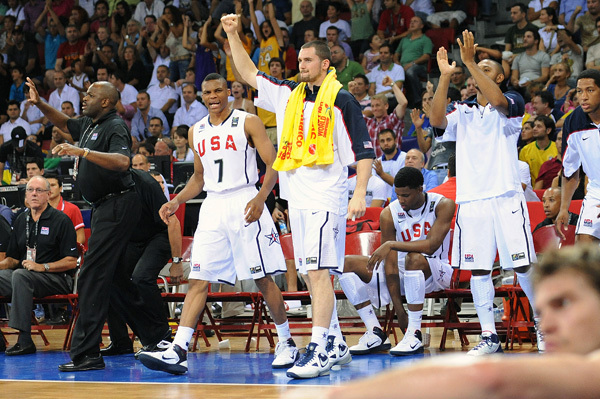 Next up: USA vs. Slovenia airs on Sunday, August 29th at 9:30 AM ET on ESPN2 and again at 6 PM ET. 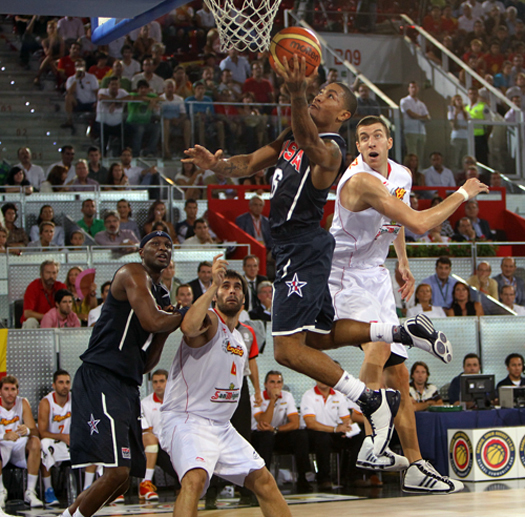 Click here to view the rest of the 2010 FIBA World Championship broadcast schedule. 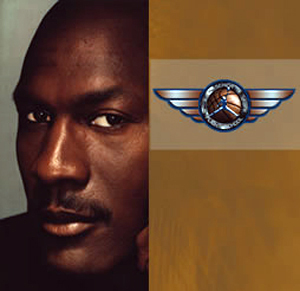 It was great to get back to Michael Jordan Senior Flight School after missing a year due to the fact that Michael and the camp directors decided to take last summer off because of the state of the national economy. Noticeably absent was longtime staff member Chuck Daly, who passed away last May after battling pancreatic cancer for several months. We talked about Chuck a lot, remembering how great he was and how much he loved Michael’s camp. Though Chuck was sorely missed, some fresh new faces invigorated this summer’s coaching staff including John Thompson III and Ben Howland. And our campers brought great energy to the camp as well. We enjoyed a very spirited and highly competitive atmosphere because of the influx of new, younger participants who fell in the 35-45 age range. We also had a number of veteran guys return who have been attending for the past 5-6 years. Possessing a winning combination of veteran experience and young talent, my Blazers team was seeded number two going into Saturday’s championship tournament. Our opening game victory against the Nuggets (coached by Bill Self and John Thompson III) allowed us to advance to the final four. In the semifinals we were matched up against the Lakers, coached by P.J. Carlesimo. It was a very hard-fought battle, but too many turnovers and missed shot opportunities eventually took their toll on our offense. The Lakers defeated the Blazers, ending our hopes of winning the Flight School Team Championship. The Lakers moved on to the finals, where they met Doc Rivers and the Bulls in a highly competitive and physical game. The Bulls led by one point with seconds remaining, but the Lakers had the final possession. When their last shot went up there was contact on the play, but no whistle. The shot missed so the Bulls held on to win by one point and secure the team championship. Now all we can do, coaches and campers alike, is hope that we will have the chance to come back next year and compete once again. As we prepared to leave camp, the big question on everyone’s mind was whether the Class of 2010 would be the last to graduate from Flight School. With Michael taking full control over the Charlotte Bobcats, he will no doubt have to shoulder many more responsibilities in his new ownership role. So Michael is going to have to determine whether he can still afford to give the campers the time he’s given them in the past. His hands-on involvement is what has made Flight School so successful for all these years. Knowing Michael and the way he wants the camp run, if he has to cheat the camp he’s not going to do it. Michael and his staff have to get together and decide whether they can run the camp the right way and make it available to everyone for another shot at Flight School glory. With a 3-1 record our Blazers team is the number two seed going into today’s championship tournament. Special thanks to Jeremy Bryan for sharing some of his photos from the camp with me. You can view more of his work on http://jkbryanphotography.com/. 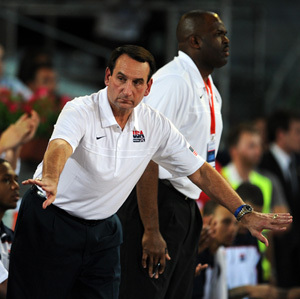 Mike Krzyzewski has been a prominent member of our coaching staff here at the Michael Jordan Senior Flight School for many years. But this summer he’s unable to join us as he’s already over in Europe with the USA Men’s National Team preparing for the FIBA World Championship in Istanbul, Turkey. After defeating China in a scrimmage and France in an exhibition game last week in New York, Team USA will face Lithuania in Madrid on Saturday – followed by Spain on Sunday and Greece on Wednesday. 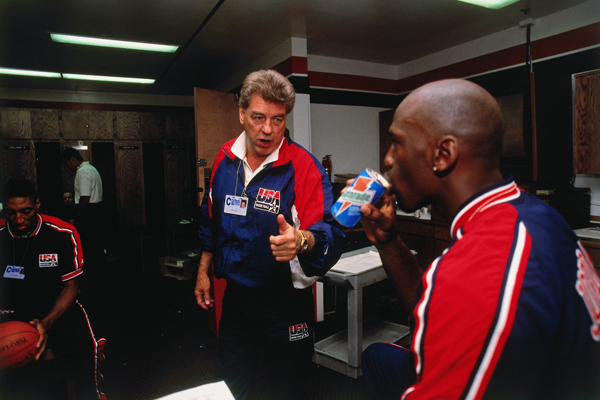 Here’s a segment from our Real Training Camp coverage of Team USA’s week-long training session in Las Vegas in which Coach K shares a lesson he learned when coaching Michael Jordan during the 1992 Olympic Games.